Poonch, Jammu and Kashmir: Pakistan violated ceasefire in Sawjian sector of Jammu and Kashmir’s Poonch district on Friday. The ceasefire violation took place at about 8:30 am. Pakistan resorted to shelling with mortars along the Line of Control (LoC). The neighbouring country also used small arms to violate ceasefire. The Indian Army is retaliating strongly. No casualties have been reported yet. 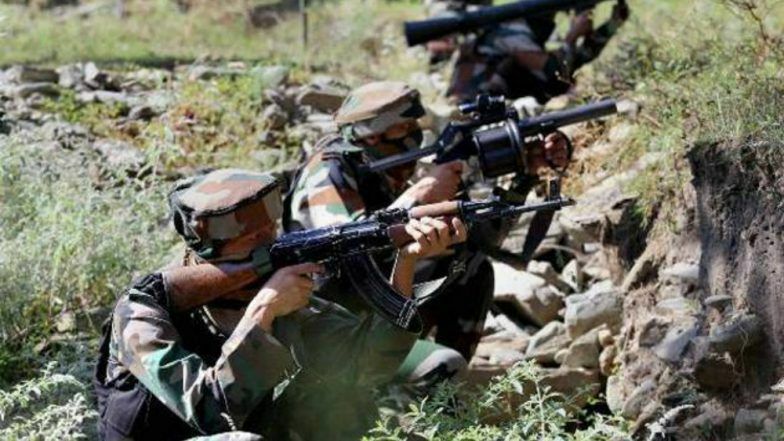 Jammu & Kashmir: Pakistan Violates Ceasefire in Nowshera Sector of Rajouri District; Indian Army Retaliates Strongly. Meanwhile, on April 1 also, Pakistani Rangers resorted unprovoked firing in Mankote and Krishna Ghati sectors of Poonch. One BSF (Border Security Force) officer was martyred in the cross-border firing. A six-year-old minor was killed in the shelling. Five defence personnel and nine civilians were also wounded in the ceasefire violation. In the retaliatory firing by the Indian forces, several Pakistani posts across the Line of Control (LoC) were destroyed. The neighbouring country also violated ceasefire on April 5 in Nowshera sector of Rajouri district. Last month, the Indian army retaliated to ceasefire violation by the neighbouring country and destroyed the Pakistani Army post opposite the Akhnoor sector. A video was also surfaced showing Pakistani flag upside down as a signal of emergency.